For those of you interested in the history of the WHA, I have added 152 new game summaries to the database at http://www.WHAHof.com, in addition to making a significant number of updates to others. Among the new summaries are games against the Soviet National Team and the Jets’ first exhibition games. With this update, I have summaries for over 91% of all WHA regular-season games online. April 9, 2012 – Winnipeg Transit launches its long-awaited Rapid Transit service. Winnipeg Mayor Sam Katz and Manitoba Premier Greg Selinger lead a host of dignitaries at the ribbon-cutting ceremony at the Harkness Station near the corner of Main Street and Stradbrook Avenue. “This marks another step forward for Winnipeg as a first-class city,” said Katz. “And the Jets are back,” said Selinger, who leaves the ceremony early to answer a call from True North chairman Mark Chipman asking for another government handout. April 10 – Two joggers on the Transitway are hit by a Rapid Transit bus. The joggers are attended by paramedics and Winnipeg Transit, on orders from Winnipeg Police Service, shuts down the Rapid Transit service. Despite clear signage and laws prohibiting pedestrian traffic on the Transitway, the joggers are not cited by police, who, instead, turn their attention to the driver and harangue him incessantly. Later in the day, Winnipeg Transit announces it will launch an investigation into the incident and, as a matter of procedure, pull the driver off the road and assign him to a desk job pending the outcome of the investigation. April 15 – After an examination of the scene, Winnipeg Police grants permission to Winnipeg Transit to resume Rapid Transit service. April 21 – Following Winnipeg Transit’s decision to allow the driver to resume his regular duties, from their hospital bed, the injured joggers hold a press conference. “We have rights!” they exclaim to a large media gathering also attended by Manitoba Justice Minister Andrew Swan, who announces that his office is considering laying charges against the driver. May 5 – Two northbound cyclists in the Transitway are struck by a southbound Rapid Transit bus. After the cyclists are taken to hospital, Winnipeg Police tapes off the scene and Rapid Transit is shut down until further notice. May 6 – The front-page headline in the Winnipeg Free Press reads, “Open Season” and features a color picture of the mangled bicycles covered in the blood of their riders. The newly-formed Winnipeg Coalition for Social Justice demands that Winnipeg Transit adopt a more compassionate approach to its Rapid Transit service and that a public inquiry be held into the “reckless actions of its operators.” “Rapid Transit has become a scourge on our community,” says a spokesman for the group. May 13 – Winnipeg Police removes their yellow tape from the scene and grants permission to Winnipeg Transit to resume its Rapid Transit service. June 5 – One month after the incident with the cyclists, a homeless man sleeping on the Transitway is struck by a Rapid Transit bus in the early morning and nearly killed. Winnipeg Transit immediately suspends Rapid Transit service. June 8 – The Winnipeg Coalition for Social Justice holds a rally at the steps of the Manitoba Legislature demanding changes to Winnipeg Transit’s “inhumane” Rapid Transit service. The rally, attended by more than 1,000 people, gets national media attention. “Winnipeg Transit is out for blood!” screams one supporter. September 1 – Winnipeg Transit reports a sharp decline in ridership for its new Rapid Transit service. “I can get out and walk faster,” says one disgruntled former rider. September 15 – The jogger hit by a Rapid Transit bus in April is granted an audience with Prime Minister Stephen Harper. The jogger, called a “victim of brutality” by the Winnipeg Coalition for Social Justice, pleads for changes to Canada’s Criminal Code to ensure that “reckless bus drivers” are taken off the road and incarcerated. December 15 – Winnipeg Transit discontinues its Rapid Transit service, citing a lack of ridership. “It is no longer economically feasible,” said a spokesman for Winnipeg Mayor Sam Katz. “There are clearly other priorities for this city. We must address the problem of homelessness first,” said councillor Harvey Smith. December 16 – In a hotly-debated session of City Council, a motion tabled by councillor Harvey Smith and seconded by councillor Jenny Gerbasi is narrowly passed that calls for an undisclosed compensation package to be paid to the joggers, cyclists, and the homeless man hit in the dedicated Transitway. In a separate motion, City Council also passes a motion to cover the expenses of the Winnipeg Coalition for Social Justice, including the cost of bus tickets for their members to attend the council meeting. May 1, 2013 – Winnipeg Mayor Sam Katz and Manitoba Minister of Healthy Living Jim Rondeau are present at a ribbon-cutting ceremony for the official opening of the Southwest Winnipeg Trailway that follows the path of the abandoned Transitway. Both Katz and Rondeau join a gathering of joggers as they run down the pathway. For that handful of people familiar with the Manitoba Moose’s 15-year history, Pat Kavanagh’s name will not stand out as one of the best players the franchise has ever had. However, he may go down as one of the most memorable figures in club history, not for anything he did on the ice, but for his small, yet fanatically devoted legion of female followers. Property of the NHL’s Vancouver Canucks, Kavanagh came to the Moose when the Canucks transferred their affiliation from Kansas City. Originally drafted by the Flyers in the second round of the 1997 draft, Kavanagh was entering his third pro season, having yet to play his first NHL regular season game. Kavanagh would score 51 goals in three full seasons with the Moose, earning little more than a cup of coffee with the Canucks. Though he failed to impress Canucks’ management, he did impress females young and old. His long, flowing hair sent hearts a-flutter in the stands and in online forums. 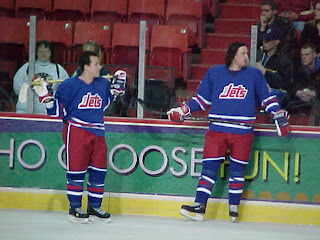 “Kavy” became the favored object of affection of groupies in and out of Winnipeg. Never mind that he couldn’t play. “He works so hard,” was a familiar refrain. True as it might have been, he was little more than a marginal player, even at the AHL level. 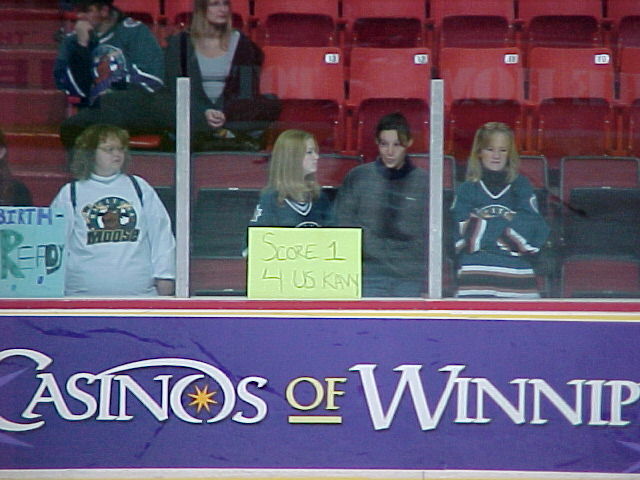 A group of women would regularly be among the first to arrive at the Arena to take their place along the glass for when “Kavy” would come out for the warmup. Sometimes they would bring signs, other times, they would press themselves up against the glass. There was a time when one of them turned her sweater around so that the “KAVANAGH 15” on the back would be facing to the front. 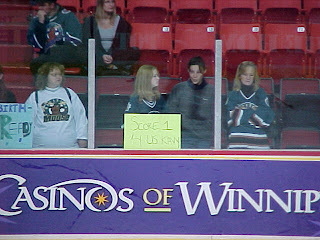 With the Winnipeg Arena virtually empty most nights, they certainly stood out and, no doubt, “Kavy” had fun with them. He’d make sure to swing by their way at least once, flicking his locks and nearly causing these women to faint. Once the games started, the Moose turned in their fair share of stinkers and those women provided more entertainment than the game itself. It must have been a dark day for them when Kavanagh signed as a free agent with the Senators organization during the summer of 2004. Kavanagh eventually got into eight more NHL games after leaving the Moose, but he never had the kind of success the Flyers or Canucks envisioned from him. Nonetheless, for some fans in Winnipeg, his career is more noted for broken hearts than for unrealized expectations. Last night, I attended Mike DeFehr’s presentation at the monthly Winnipeg SQL Server Users Group meeting, held at the offices of Online Business Systems. More importantly, given Online’s location buried in the middle of one of the worst areas of the cesspool known as downtown Winnipeg, I escaped without incident. I was not stabbed, shot, or even accosted. There’s got to be a first time for everything and this was it. Upon arrival, I found the doors locked. There was a sign directing any attendees to call D’Arcy at a certain number if the doors were locked, but I happen to be one of the last of a dying breed, or so it seems, without a cell phone. While hunting around for a pay phone, a group of people were leaving, so I got in when they opened the door. With the aroma of free pizza in the air that lingered in my nostrils hours after the meeting, Mike went through a very informative presentation on the new features coming in SQL Server 2012, code-named “Denali”, scheduled for release some time in the first half of this year. For starters, he talked of the new “AlwaysOn” availability features. There will be new mirroring features and applications connecting with “read-only intent”, as he put it, will be automatically redirected to a read-only server. I presume this will involve a new parameter in a connection string. There will also be an option for failovers in groups, but it will require installing SQL Server on an Enterprise version of Windows that is a member of a Windows Server Failover Cluster. In this case, SQL Server will leverage the Windows clustering technology rather than provide its own. All the “classic” methods of database mirroring will still be there, and, to the best of Mike’s knowledge, are not being deprecated. Turning to security, the ability to create user-defined server roles will be introduced. Mike also demonstrated another new feature called the contained database, where the security is contained within the database without the need to map a database user to a login object. There will be a new feature called FileTable, built on the FILESTREAM concept, which will allow access to specified directories on a file share using SELECT queries without having to resort to xp_cmdshell. Furthermore, the contents of individual files will be accessible through T-SQL and SQL Server’s full-text search capabilities can also be utilized on individual files, not just table content. Mike was unaware as to whether this feature will be available in all editions of SQL Server, so that’s something to investigate for those that are interested. As expected, the GUI tools are based on Visual Studio 2010 and there will be a new set of data tools available. There will be integration with source control, a new table designer, and these tools will be available in all editions, including the free Express edition. There is a potentially very valuable feature called Apollo, which allows for a ColumnStore index on a table. In this case, the index is created by columns, not by rows. The results are dramatic improvements in performance and speed of some complex queries, but there is a catch. Not only does putting a ColumnStore index on a table make it read-only, but the creation of a ColumnStore index requires a lot of server resources. Mike wound up the presentation showing us some additional useful features. There will be built-in support for paging with an OFFSET clause in a SELECT query, the ability to create sequences, much like Oracle, and new T-SQL functions such as TRY_CAST, TRY_CONVERT, EOMONTH, and IIF. It was definitely worth the trip, and for and professional in IT who works with SQL Server, I would highly recommend attending any future meetings. Mike is a highly-skilled SQL Server guru and professionals of all levels of experience can learn from his presentations. More details on the group can be found at http://winnipeg.sqlpass.org. This morning, I went past the Siloam Mission on Princess Street. Self-described as a “connecting point between the compassionate and Winnipeg’s less fortunate,” they are a Christian humanitarian agency providing food and programs for the homeless. Many people donate their time, money, and articles of clothing to the mission. Standing outside the mission this morning were a number of their clientele. They were puffing on cigarettes. If they can afford to kill themselves, they can afford to feed and house themselves. It is those people that should find the door locked when they try to go back in. Siloam Mission is a noble effort, but it turned my stomach to see their efforts so blatantly taken advantage of. The mission has shown respect for the community, now it needs to respect for itself, the time of its many volunteers, and the money of its many donors that include you and me.